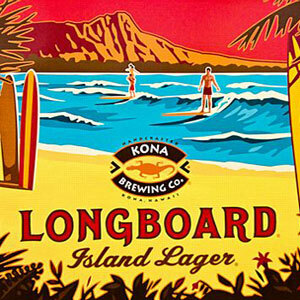 This Hawaiian offering is pretty simple, even for a lager. Fitting into the “supposed-to-be-light-because-you’re-supposed-to-drink-it-at-the-beach” style, this lager is decent overall. It’s smooth from start to finish and is never offensive, offering basic lager flavor that only appears in the middle of each sip and is relatively plain. Despite the rudimentary flavor profile, what is nice is that Longboard has a little more body than other similar beers, such as Landshark. Too many beers in this vein taste more like water than beer, which I suppose is the point, but while Longboard’s body reminds you that you’re actually drinking a beer, I’d still like a little more flavor. Longboard is like Dos Equis with less flavor and just the slightest more body. At no point did I ever not like Longboard, but I’d rather have something else. It was always my plan to review the staples from Leinenkugel before I got into their seasonals, but when I saw Snowdrift Vanilla Porter in the store, that plan was foiled. I never had any of the darker varieties from Leinenkugel before this, so I didn’t know what to expect. To be honest, I went into Snowdrift expecting a winter beer that didn’t deliver on flavor and underachieved, characteristics I often find with beers from this brewery. What I found was a very tasty winter beer that matches up to other top-notch varieties. Snowdrift meets all the standard characteristics of a porter, and while not the best I’ve ever had, will not disappoint. Dark as you’d expect, this porter delivers smooth, rich and savory flavors. You’re met with creamy vanilla from the beginning, which peaks in the middle and tapers off towards the end, leaving almost no aftertaste. Throughout each sip caramel and coffee notes seem to flow seamlessly from the vanilla, which only enhances. The only flavor that lingers is a soothing and warming vanilla flavor that is nothing but tasty. At no point is the flavor imbalanced, too weighty or out of sync with the mouthfeel, and the only quality it lacks is a smoky component (which is always an added bonus anyways). This beer is as light as you’d expect a good porter to be, of course matched with nice flavor, and because of this it is very drinkable. The warming the beer imparts is not inhibited by the weight. Another reason this porter is easy to drink is due to it’s refreshing nature, in this case a lighter feel due to what some would call watery. Every Leinenkugel beer I’ve ever had has this “watery” component, sometimes appropriate and sometimes not. In this case it’s neutral. Some might say, due to the style, it’s a detriment, but for me it makes this beer that much more refreshing. Most importantly, it doesn’t take away from the flavor. Because Leinenkugel is now a staple in the Chicago area, I will give more of a background on them the next time I review one of their beers. I’ve had just about each Leinie’s variety, and Snowdrift is my new favorite. Some beer geeks might shy away from buying anything Leinie’s, which I understand, but this one must be tried. 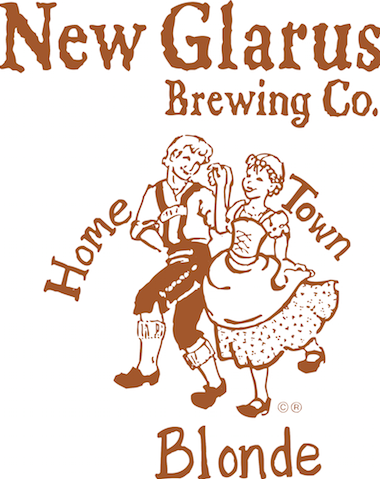 I always have high expectations for any beer from New Glarus, especially a style as simple as a pilsner. This is not your typical pilsner, however, but if you’re fan of rich ones, you’ll love Hometown Blonde. For starters, this pilsner is on the heavier side, at least as pilsners go. Hometown Blonde uses four varieties of German hops to achieve a richer and creamier “Old World” style pilsner. Hops clearly comprise the backbone, a concept I’ll never argue with, but from a person who’s not the biggest pilsner fan, they’re a little much at first. I wouldn’t go as far as to say they tasted stale, but their strength clashed with the light and creamy texture. I wasn’t used to this, as it’s been a good long while since I’ve had a legit pilsner, but Hometown Blonde grew on me. Hops add meat to the normally-bland pilsner, and this is one I would willingly pick up again. If you like a good pilsner you’ll love Hometown Blonde. The flavor is consistent and finishes clean without an aftertaste, but the middle was a little much for me at first. If you’re not used to thicker pilsners, don’t pass judgment quickly; if you know you’re a pilsner fan, this is for you. On a recent trip to North Carolina I was able to enjoy a handful of beers from Natty Greene’s Brewing Co., based in Greensboro. I really liked almost all the beers I tried from this brewery, and I’m here to review my favorite of the ones I tried. The south was a relative latecomer to the microbrew phenomenon, but now is starting to produce some very fine beers. North Carolina in particular was ahead of the game, and I thoroughly enjoyed what I had from Natty Greene’s. Without further ado, my first review from the south is Buckshot Amber Ale. What I really liked about Buckshot was how balanced it was. As you’ve probably gathered from other reviews of brown and amber ales, I expect a lot from the styles. I believe the perfect dark ale must have a distinct malt or nutty element while not being too heavy and still refreshing. Buckshot fit these pretty well. For starters, the beer is very refreshing. It’s body is enough to satisfy a serious beer craving while not weighing you down or filling you up. It’s incredibly easy to drink, which is aided by the smoothness of the flavor. The malt is strong enough to let you know what you’re drinking and deliver in the hearty flavor category, but it’s in great balance with the body and mouthfeel to be very well-rounded. The flavor doesn’t “wow” you with anything overpowering or shocking, but delivers what it should. At the finish only a slight residue remains, but dissipates quickly to rid any possibility of getting stale, and the satisfying sip is complete. The only drawback is that after a while the nutty flavor that was at one point subtle becomes more apparent and builds, which can then get a little old, but aside from this it’s just about a perfect brown ale for me. 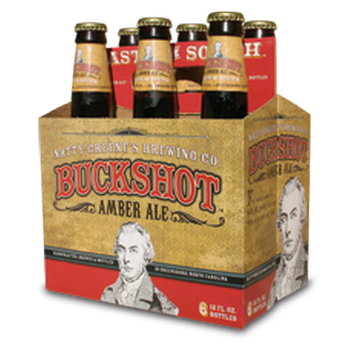 Buckshot was the highlight of my Natty Greene’s experience, but the brewery has many other good beers; I particularly liked Guilford Golden Ale and Wildflower Witbier. If you’re in North Carolina, look for this brewery. Smuttynose’s summer seasonal is a solid wheat ale, on par with what you expect from Smutty. Technically this is an American pale wheat ale, and while not as outstanding as others that fit the style, it does offer something a little different. To me, Summer Weizen is in between a wheat ale and a hefeweizen, and it works just fine. In the beginning Summer Weizen tastes more like a traditional wheat ale, with a subtle sweetness that isn’t bitter. As the sip progresses, hefeweizen qualities emerge with more fruity flavors and a hint of banana. All the while a wheat backbone links the two together, making the transition nice and seamless, and the finish smooth and uplifting. This beer is very simple, yet it works. The flavors aren’t robust, which makes it refreshing and easy to drink, which works hand-in-hand with it’s lightness. Overall, this is a nice summer beer. It’s never too heavy or bitter and is refreshing, ending each sip with calm hefeweizen qualities. If you’re looking for a full-blown hefeweizen, though, this isn’t for you. 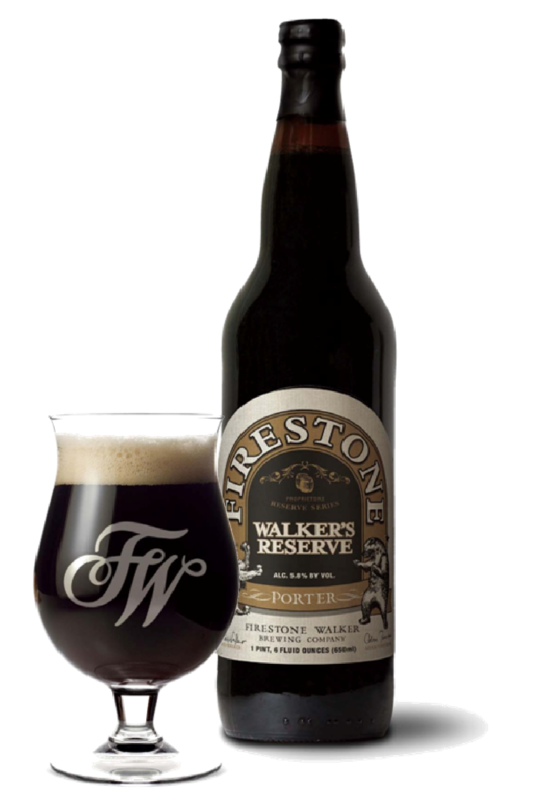 Walker’s Reserve porter isn’t as stellar as some Firestone Walker offerings, but it’s still very good. Black in color with a head that’s both fizzy and creamy, the first thing you taste is chocolate and slight caramel. The front end of each sip provides the bulk of the flavor, which slowly dissipates as it continues, but is never scant. The flavor changes slightly in the middle, which to me yields oatmeal, yet still retains some of the chocolate. Although the flavor peaks at the beginning, by the end the flavor is still very nice and yields almost no aftertaste, which works very well because this porter is very refreshing. The flavor is rich and the mouthfeel is middle-of-the-road for porters, but Walker’s Reserve is still light enough to never weigh you down. The chocolate-to-oatmeal transition is what sticks out most to me about this porter. It’s very drinkable and a great “everyday” porter: nice enough to enjoy often but still not on the top shelf. This is one limited release from Big Sky I wish wasn’t limited. 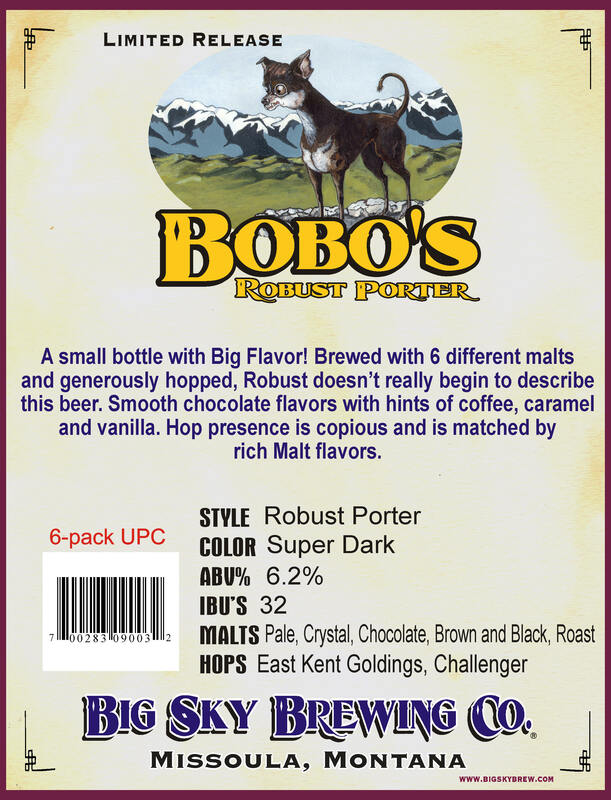 Bobo’s is an excellent porter that gives you a touch of everything the style can offer. Black in color with a dark brown, chocolate-looking head, it has a smoothness you’d expect after looking at it. The mouthfeel is creamy, soothing and packed full of multiple flavors that, while subtle, are still satisfying. Throughout the sip you notice bits of caramel, coffee, chocolate and some of the patented porter smoky flavor. Each is subtle enough to blend together wonderfully, none out-shining the others, so that the overall flavor is rather subtle itself. Any more flavor and it would be too much for the lightness of the beer. Instead, the subdued-yet-noticeable flavors fit right in with the refreshing mouthfeel. To top it all off is a creamy finish that’s not as creamy as a stout and delivers one last bit of chocolate to bid farewell. It might sound like there’s a lot going on, but there’s really not. Bobo gives a touch of everything without giving too much, tasting very simple in the process. If you’re looking for a dark beer with good flavor that isn’t overpowering, or a porter that gives you what porters should, Bobo fits both bills. This is a top-notch porter and another great Big Sky creation. Lately, many breweries have been trying their hand at black IPAs. Uinta’s Dubhe, an imperial black IPA, leaves a lot to be desired. While the malt and hop elements are equally potent and noticeable, they don’t blend well and create a flavor that just doesn’t taste that good. The malt component isn’t bad; it’s bold and chocolaty and yields a lot of flavor. The main issue with Dubhe is the hops. In-your-face for sure, the hops don’t fuse well with the malt side of things. The average amount of hops you’d expect to find in an imperial IPA are there, but don’t taste very good. They taste somewhat stale, aren’t smooth and yield very little citrus notes. The sweetness from the hops, if any at all, is overpowered by the malt, so the only part of the hops you taste is the bitterness. You taste this for the duration of the sip, and at the finish it only increases. The body isn’t too thick for what you’d expect of a black and imperial IPA mix, but the weighty flavors, mostly from the hops, make the beer seem thicker than it actually is. Due to the subpar hop flavor it’s also less smooth than it would be otherwise. Eventually I didn’t want to finish mine. You expect a lot more out of IPAs from the west, and this one didn’t live up to expectations. by StevesBeerBlog in Double / Imperial IPA Tags: California, Double / Imperial IPA, Double Jack, Firestone Walker Brewing Co. This isn’t the best double IPA I’ve ever had, but Firestone Walker’s Double Jack is definitely on the top shelf. As part of the brewery’s Proprietors Reserve Series, this beer spends extended time in bourbon and wine barrels to enrich flavor as much as possible. What is produced is a double IPA that yields copious amounts of complex hop flavor. The brewers call the combination of strong flavors in Double Jack “aggressive,” but they only seem that way if tasted individually. Taken as a whole, the beer is smooth and the powerful flavors blend so well they’re hard to discern. Above all else, hops are the most noticeable flavor element. They control the scene from start to finish, and while they’re extremely pronounced, they’re easy to handle. Double Jack is very smooth and feels lighter in your mouth than you might expect. The beginning of each sip greets you with a hop explosion, and as it continues, the same hop flavor is sustained. While hops are by far the main flavor component throughout, by the end of each sip they are most potent. The blow is lessened by citrus flavors, predominantly grapefruit, rounding it out. It’s refreshing and satisfying, giving you all the hops you want – and more – without overpowering. The trick to help balance the strong hop component is malt. While the malt flavor never overcomes the hops, it provides what the beer needs by neutralizing some of the hop sweetness. This also adds smoothness to the beer, making it creamy and smooth, which avoids any lingering flavors that throw off the beer. To top it all off, the extended time Double Jack spends in barrels enriches the maltiness and smoothness. The barrel aging further brings all the elements together, making Double Jack richer and deeper in flavor while adding even more smoothness. Upon the first sip, this seems like a very simple imperial IPA, but the more you drink it, the more appreciation you gain. The depth of flavor is noticeable from the first sip and only gets better as you drink. For me, this is Firestone Walker’s flagship beer. While I’m not rating it as high as Union Jack, for some reason Double Jack sticks out more for me. Maybe I’ll put a finger on it someday, but for now, if given the opportunity to have a Union Jack or Double Jack, I’ll choose the Double. To put it simply, Union Jack is everything you want an American IPA to be. It’s simple yet remarkable, and delivers everything you hope to get when you taste for an IPA. A wonderful golden color and slightly citrusy aroma set the stage before each sip. Upon drinking, Union Jack is smooth from beginning to end. Hops are clearly the dominant flavor, as they should be, and provide classic sweetness and citrus notes that are pronounced, but not overpowering. The flavor is the same from the beginning of the sip to the end, reaching it’s pinnacle at the finish as the beer gives a final burst of hops. It’s not too strong, though, and doesn’t leave an aftertaste that is stale or syrupy. Instead, you’re left with the same hop presence you enjoyed during the sip, only a little more amplified. While it’s easy to rave about the flavor of this beer – which is marvelous – the thing that sets Union Jack apart from the rest is the perfect balance it has. To aid the smoothness is a medium thickness that completes the body. If it were any lighter or heavier things would be out of place; the beer would have too strong a flavor for the profile or it would be too heavy to drink easily. The slew of malts used has an impact here, rounding out the flavor. The almost velvety mouthfeel is refreshing, quenching your thirst while making you salivate at the complex flavors at the same time. Because the hop flavor is also in balance, it emerges from the beer naturally. The sweetness and citrus are definitely there, but any more would make the beer taste much heavier than it actually is. Any less, and it wouldn’t be enough. When all these elements are put together, you’re left with the perfect American IPA. You get all the hops you hope for: a bit of sweetness and citrus, refreshment, full flavor and, most importantly, satisfaction. 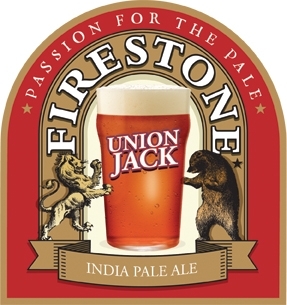 If you like IPAs, you’ll love Union Jack. If you don’t like hops, this probably isn’t for you. Hops are laid on thick, just not as thick as a double IPA. If you’re looking for a great IPA, not much else compares to this. This is what the great American IPA is all about.